Vote for GAH in Vivint Gives Back Project! Do you want to help GAH win $$ for programs that help our veterans? Vote once a day to help get us to the next round. It only takes 30 seconds and you would be helping GAH reach more veterans and recruit more providers. We need to continue to get the word out about GAH and the great work we do. I need everyone's help by voting and urging friends and family to vote! You can vote once a day! Packing Inferno is the first person account of a twelve year Marine officer who commands a platoon in Iraq, only to find himself fighting another war within as PTSD gradually overwhelms him. Tyler Boudreau is a gifted writer whose work about combat, PTSD and the moral issues surrounding war has appeared in the New York Times, The Boston Globe, The Industry Standard. Huffington Post, Seattle Times and New Hampshire Daily. Boudreau records his combat experiences in 2004 first in and around Fallujah and Lutifiyah and then at various Forward Operating Bases around Baghdad. His struggle to codify and give meaning to the realities of war, and his disintegration of self when he’s unable to makes for fascinating reading. When asked to deploy a second time to Iraq Boudreau refuses and is punished by being given the duty of notifying family members that their Marine has been injured or killed. Once he has left the Corps Boudreau must confront his own hidden injuries and try to save himself. Boudreau draws on philosophy, literature, military history and the most intimate details of his own emotional landscape to chronicle his journey through Dante’s rings of hell. This is ultimately a story of a man disassembled by war left with no guidance as to how to rebuild himself. Packing Inferno is a significantly useful book for mental health providers at only 221 pages. Boudeau’s “voice” is fairly sophisticated which may make his writing less accessible to young readers. Saagara develops affordable, accessible tools that focus on the foundations of health and wellness, including diet, exercise, and proper breathing. This past November the Michigan-based digital health and wellness company launched a "Healthy Veterans, Happy Families" campaign to raise funds for GAH. In honor of Veterans Month, 10 percent of Saagara's November app revenue will be donated to Give an Hour™. Their app, called Pranayama, is a breathing tool for reducing stress and anxiety. It focuses on slow, deep breathing and guides the user with calming music and animated visuals to gain energy, focus, and relaxation. It is available for use on a mobile device such as the iPhone, Android, and iPad, or on your PC or Mac when you join the Saagara Member Community. Lethal Warriors is a journalist tour de force about the 506th Infantry Regiment, the WWII “Band of Brothers” and the horrific crimes a group of young veterans from the unit commit in Colorado Springs after multiple tours of duty in Iraq. 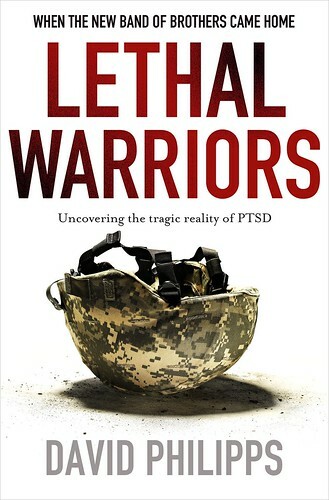 Philipps’ adroit handling of the chilling true story of these “lethal warriors” sheds a bright light on their struggles with severe PTSD and failure to reintegrate into society. Moreover as his story progresses it becomes apparent that as crime after crime is committed, the loyalty nurtured by the Lethal Warriors “down range” morphed into a twisted code of silence that enabled these soldiers to slip deeper into self destruction from alcohol to drug use to violence and ultimately, multiple killings. Story after story demonstrates what happens when reflexive fire training, combat stress, negligent leadership at home and drugs and alcohol are combined. While Philipps focuses primarily on the crime spree, he does not neglect those who worked assiduously to address the issue of combat stress, particularly General Mark Graham who was commander of Fort Carson during this time. Near closure there is a chapter devoted to the EPICON finding, a research effort into the destructive pattern of behavior at Fort Carson conducted by a team of physicians and PdDs in 2008. The EPICON findings spurred the national Comprehensive Soldier Fitness program, a nationwide initiative to counteract the effects of combat stress. This excellent book is a “must read” for any mental health provider who intends to work with military service members with mental health needs. It is also appropriate for veterans and family members who are able to handle the graphic descriptions of violence but is not appropriate for readers under 16. If you are interested in individual or corporate giving, please contact Katherine Wilkins, director of development, at kwilkins@giveanhour.org. The Standard Charitable Foundation, the philanthropic arm of Standard Insurance Company ("The Standard"), has announced a one-year $25,000 grant to Give an Hour™. This grant, the third made to the nonprofit organization since 2008, brings the total awarded to Give an Hour™ by the Foundation to $115,000. "At The Standard, we strive to help people achieve financial security," said Greg Ness, president of The Standard Charitable Foundation and president and CEO at The Standard. "This philosophy also guides the Foundation's commitment to support organizations such as Give an Hour™, whose positive impact on families and individuals dealing with disabilities, mental health issues, and the loss of loved ones can be felt in communities throughout our nation." "Financial support from The Standard Charitable Foundation over a three-year period has helped us continue to make a real difference in the lives of U.S. military personnel and their families," said Dr. Barbara Van Dahlen, founder and president of Give an Hour™. "The Standard has stepped up in recognition of this very deserving population--helping to address the psychological needs of military personnel and their families so that they can live better, more fulfilling lives." The grant from The Standard Charitable Foundation will help Give an Hour™ recruit additional mental health professionals to its nationwide network of providers, allowing us to provide more services to veterans of the Iraq and Afghanistan wars. For more information about The Standard Charitable Foundation, please visit www.standard.com/foundation. Speaking of Providers...Do You Have Your Free HelpPRO Listing Yet? Are you aware that mental health professionals who join Give an Hour™, offering their time and professional help to returning troops, receive a one-year free basic listing in the HelpPRO Therapist Finder, a $75 value? Go to http://www.helppro.com/counselingforsoldiers.aspx to sign up. Give an Hour™ and HelpPRO--a leading online therapist finder used by thousands nationwide to locate mental health professionals--began collaborating in 2008. The goals of the collaboration are to expand the reach of Give an Hour™ and HelpPRO to mental health care volunteer providers and to explore additional opportunities to bring mental health care services to the military men, women, and families who serve our country. William L. Blout, LICSW, HelpPRO's president, says, "HelpPRO is committed to helping returning soldiers and their families. HelpPRO would like to see every one of the 5,000 professionals volunteering with Give an Hour™ take advantage of their free offer to list in the HelpPRO Therapist Finder." In addition to collaborating with Give an Hour™, HelpPRO is also working to offer providers listed with HelpPRO special training working with the military, particularly with PTSD and trauma experienced through combat. Providers listed with HelpPRO can sign up for free online training through Citizen Soldiers Support Program (CSSP) out of the University of North Carolina. When Every Day Matters is a memoir by MJ Hurley Brant about her family’s struggle to overcome her daughter’s fatal brain cancer and the first year of living without Katie who succumbs to the cancer at age 28. If the reader is a parent, it will be difficult to read the second half of this book with dry eyes because of the emotional honesty of Hurley Brant’s descriptions of her despair and deep sorrow at the death of her daughter. However these passages also provide some excellent and universal coping tools for dealing with the death of a child from practical reminders to drink more water so that your body does not suffer dehydration on top of emotional devastation to creating memory gardens and altars to channeling sadness by helping others. For Hurley Brant’s moving meditation on what matters most in life confronts the unthinkable with courage, compassion and candor. Although this memoir is not military-specific Hurley Brant’s message is relevant to family and friends of service members killed in war: If we are alive we cannot escape loss. Loss is a part of real life. To make it easier for visitors to Give an Hour™ to locate a provider who best fits their needs, we ask that Give an Hour™ providers log into their profiles and add the following specialty areas, if appropriate. As always, we welcome the feedback of our providers. If you have a suggestion or comment about additional specialty areas to offer, please let us know at info@giveanhour.org. In this book Richard Taylor traces the history of American veterans coming home from war with the same anticipations, hopes and fears that were first chronicled by Homer in Ulysses. A military historian and journalist Taylor starts with the Revolutionary War and ends with the current conflicts in Iraq and Afghanistan. He uses personal memoirs, diaries and interviews to show how universal (and often misguided) expectations are when a soldier returns from combat and how war changes those who participate in it. Unlike other histories of veterans that focus on a group or more usually, a single war, Taylor compares and contrasts all returns. Each chapter begins with a battlefield scene followed by an explanation of the conflict and how veterans were treated when they returned home. Along the way we get a good picture of how the federal government evolved its response to veterans’ issues and needs and how difficult it has been to get the attention of society once war is over. Taylor touches on, among other issues, education, employment, mental health, marriage, health, benefits, retirement and burial. This book is suitable for anyone interested in an historic perspective from providers to military service members. Shade It Black is a memoir is by a young enlisted Marine who recalls her deployment and experiences while serving in a Mortuary Affairs unit in Iraq. The unit is assigned to retrieve and process the remains of both Americans and Iraqis who are killed in war. Sometimes the platoon is sent on a convoy to bring remains back to base, and sometimes units bring their own fallen. Goodell’s writing is powerful and her voice entirely credible as she tells of the effects of all the horror and carnage on the members. Her shattering portrait of the conditions and day to day work processing American service members’ remains, often pulverized from IED explosives and being ostracized by the rest of the camp is riveting. Those in her unit cannot eat or sleep, and some ultimately lose their minds. Goodell’s descriptions of what it is like to be one of only two females in the unit are particularly poignant while also disturbing. She paints a clear picture of how difficult it is for a woman to join, train and serve as a US Marine, particularly in theater. When her account becomes especially relevant is when the unit returns home and to a man and woman find that their experiences in Mortuary Affairs continue to haunt them. Goodell describes a heart-rending lack of support from the Armed Services in dealing with the psychological issues that surface once everyone is home. Goodell enters into a long term abusive relationship self-isolates, uses drugs and alcohol and, upon occasion, lives in her car. This book is not for the faint-hearted but it is compellingly written, and should be read by every mental health provider who wishes to understand the military experience during war or to become better acquainted with what it is like to be a female in the fiercely male culture of the Corp.
Sophia Raday was a Berkeley-dwelling peace activist when she fell in love with Barrett, a West Point graduate, cop, Airborne Ranger and a major in the Army Reserve. During the early part of their marriage they struggle, successfully, to find a middle ground because their political views differ so dramatically. Soon after the birth of their son, September 11th occurs and Barrett’s military escalate along with the country’s. Suddenly Sophia finds herself living on a military base while Barrett deploys to Iraq. Sophia and Barrett learn that love doesn’t come from sameness and peace doesn’t always come from agreement. Condition Yellow is a writer’s description of life under siege, “In Yellow you bring yourself to the understanding that your life may be in danger and that you may have to do something about it. Raday’s memoir is an insightful snapshot of military and police life from the points of view of a military wife during the first years of the Iraq war and a warm love story as well. Raday’s style is funny, honest and effortless to read. Appropriate for military spouses of all ages as well as marital counselors. Documentary Review - "Hidden Battles"
Hidden Battles is a feature-length dramatic and deeply personal documentary about the psychological impact of killing on the lives of five soldiers. Representing a cross section of nationalities, gender, class and race, the soldiers tell of their combat experiences and their feelings about the central act of war – killing another person. The film is consciously apolitical, and does a good job of drilling down to the core challenges of building a balanced life and coming to terms with oneself after the fighting has ceased. The five soldiers are Zachariah, leader of the Al Aqsq Martyres Brigade, a Palestinian who has killed an Israeli, Aaron, a former US Marine who was deployed to Somalia in 1994 as a scout/sniper, Esmeralda, a fighter in the Sandinista Revolution in Nicaragua thirty plus years ago, Saar, a Special Forces officer in the Israeli Army and George, an African American Vietnam Veteran. With three of the five “voices” subtitled and multiple cutting back and forth, Hidden Battles still manages to sustain emotional impact as the soldiers talk at length about their struggles to accept that having killed is now a fact of their lives. The film explores how they process that fact, often minimizing or deadening their feelings yet occasionally being overwhelmed by them. Although Hidden Battles does not involve any veterans from OIF/OEF, it is a good exploration into the complexity of emotional struggle with what it means to kills in all of its complexity. It offers insight into internal conflicts of veterans once they have left the battlefield. Appropriate for mental health care providers, service members and military family members 18 years and up.